What are virtual page views and why would you need them? Dynamic reload after form completion – after filling out a form a user stays on the same URL which means you aren’t be able to track this action with your web analytics platform. To deal with this, we can create a unique virtual URL (anyone you want) and set it as a goal URL after a successful form completion. You can also set up an event, but unfortunately it can’t be used in funnel configuration. Links to other domain websites – you can measure traffic from other domains (unless is it yours too) so clicks to, for example, your Facebook fanpage can be tracked as example.com/facebook-fanpage URL in your analytics. The second line (just after <script> tag) is responsible for setting the Custom page title which will be visible in Piwik reports. While this is optional, it is recommended. The third line is the key part of our operation – we are defining the custom URL which will be visible in Piwik’s Pages report. Note that it is a full website URL and only specific page (register) is virtual. We can insert any page name we want, but using an already existing page name could, of course, disrupt our reports. After setting up the code itself, we have to fire the tag at the correct moment. In this case we need to define the tag’s trigger as the click of the Sign Up button in head bar. Click Add to save the new trigger, and then Save to save whole tag configuration. 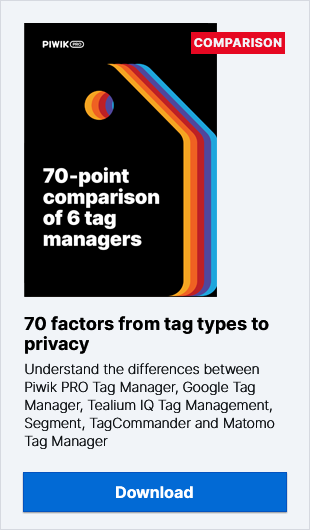 And if you’d like to learn more about the usefulness of tag manager, be sure to check our Tag Manager User Guides. Notice that on the last screen we see a Goal completion called Menu Bar Sign Up which refers to the same action as our new virtual page. This is indeed the same action and this goal was configured earlier. We show this to present different ways to use goals. Having a new, separate and unique URL available in Piwik reports you can now easily create a new goal based on this URL, use this URL in your funnels or just track stats for this object.